0 Comments Published by KL Ocs Kid on Monday, August 20, 2007 at 5:12 PM. Gerard Houllier once claimed that it was referees, not players, who cost managers their livelihood. Such ineptitude, frustratingly, can also determine the direction of a championship. I’m not one for needlessly lamenting match officials. I’ve sat on the Kop with my father and cringed in the wake of the occasional tirade. Indeed, up until very recently, my opinion was one staunchly against the introduction of technology. We are all human after all, culminating in the inevitable mishap. But there is a crucial difference between the odd howler and consistent, costly misdemeanours. To put it lightly, despite being of the mankind variety, Rob Styles would not be welcomed in my home. It is no exaggeration to say the penalty award given on behalf of Chelsea this Sunday has to be one of the worst in Premier League history. Like summer rain this annoyance could not have arrived at a worse time. For Liverpool were not only on top, in this, the first of the so-called big four showdowns, but dominant. Fernando Torres‘ first of the season was scant reward for an encouraging performance which set the benchmark. Our inability to convert chances when in the ascendency is of irritancy, but for debating another day. That is because there is only one topic of discussion upon all Kopites lips now. Unfortunately, it is he who should never be discussed, the man in black. Only Johnny Cash can don such an outfit and sustain credibility. Any ounce of the latter Mr. Styles’ still possessed, vanished in the wake of his cowardice, refusing to admit faults when asked. That, more than anything, torments. As Steven Gerrard rightly queried, players are forced into apologies’, why not officials? In all truthfulness, the afternoon began badly for Styles and simply tailed-off from there on in. Without meaning to build a pedestal here, I continually bemoaned “he’s booking too many players”. This last statement was not said in jest or bias, but applied to both sides. In the end it resulted in what can only be described as a Graham Poll scenario (definition - catastrophe). Do not be swayed by contrary opinion, Michael Essien was booked twice at Anfield. The video replays are as clear as an Everton trophy cabinet. To save face, the referee pronounced that John Terry and John Terry alone, was carded during the melee in focus. If this was the case, why did Essien embark on the usual ritual accompanying dismissal? We all know the routine, that where the hands are clasped upon the head and the eyes adopt a helpless, bemused edge. Only usually, all this is proceeded by a trudge of the condemned nature. Essien remained on the field of action - much to the horror of Liverpudlians. A never-ending myth has circulated this fixture since 2005, that which points to Liverpool’s luck in the contentious semi-final of the same year. Well, let us be Frank (something which would require the addition of several pounds in weight), Luis Garcia’s shot DID cross the line. And, had it not, Petr Cech would undeniably have been red carded, leaving the Londoners with ten men and a penalty to face. Furthermore, are we all forgetting one deliberate handball of Tiago the previous January? That day Mike Riley, for want of a better phrase, ‘bottled it’. Today, Rob Styles did the same. Make no bones about it, Chelsea have had the luck in this series of encounters. Frequent gesticulation and intimidation coaxed Styles into awarding that spot kick. Florent Malouda looked as confused as Jade Goody when aided here. The likes of Lampard, Drogba and in particular John Terry, scare someone like Styles. He should grow some backbone and learn to overcome their pressurising jibes. Only then, will a league be one by a team deserving of it. Or maybe it is us who should review the situation. Can our constant topping of the fair play league coincide with a whimper of a title assault? Perhaps, though below board, we should acquire some antics of our own. Having said this, it is hard to imagine Dirk Kuyt screaming like a schoolgirl the way Messers Drogba and Robben do each time their breathed upon. What actually transpired on Sunday afternoon was a foul against Steve Finnan. The Irishman was bundled into by the wayward Malouda, causing both men to lose their footing. 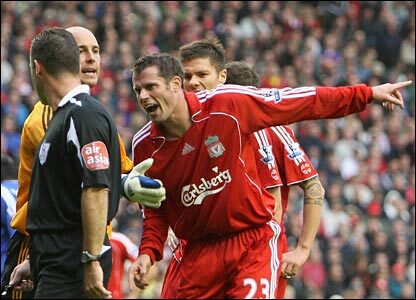 Had Jamie Carragher or Pepe Reina lambasted the ref at the time, we may well have won the restart. Instead, a shrinking, scared little excuse for a man envisaged the wrath of Terry and co. hence the disgrace of a decision that followed. And that is what it was folks, a disgrace. Thank you, Rob Styles, for spoiling my Sunday.